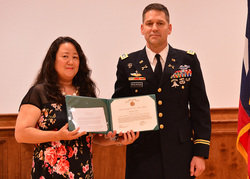 Sonnie Mosier, Stephen F. Austin State University's Department of Military Science administrative assistant, received the Public Service Commendation Medal, one of the highest public service decorations the U.S. Army gives to civilians. NACOGDOCHES, Texas - A Stephen F. Austin State University employee was honored recently with a Public Service Commendation Medal from the U.S. Army. Sonnie Mosier, an administrative assistant in SFA's Department of Military Science, received the medal, which is one of the highest public service decorations the Army gives to civilians. According to the Army's website, the award recognizes "service or achievements that contribute significantly to the accomplishment of the mission of an Army activity, command or staff agency." Mosier, who has worked in the military science department for 21 years, has participated in the commissioning of 266 of the 646 cadets who have completed SFA's ROTC program. She serves as the university liaison for military science faculty and staff and supports the cadets in various instances. "What I've enjoyed most about my time with the department is watching young men and women go through the program to be commissioned as second lieutenants," Mosier said. "I also have enjoyed meeting so many awesome military science faculty and staff who have come and gone." After joining SFA in 1994 as a receptionist in the Office of the President, Mosier worked in the Office of Admissions before settling in the military science department. Since then, she has been a continuity in the department by assisting eight department chairs, numerous faculty and staff, and hundreds of cadets. For more information about SFA's ROTC program, visit www.sfasu.edu/rotc.